After all the recent rain, it was refreshing to have sunny skies and 50 degree temps on race day. The light fog lifted well before our 10:09:30 (second to last team!) start time. This is the 16.7 mile “Three Bears Course” with two major climbs and our 3rd annual TTT on the tandem at this event. We did the pre-race analysis and determined that 3rd place was a possibility for us. We concluded first and second place would be secured by a significant margin. We projected that four tandem teams would be within one minute of each other competing for 3rd place. So going into the event, we knew that every second would count. Also, we knew that time would be gained or lost on the climbs after the first downhill. We had a good start and settled in below threshold pace. When we got to the start of the first downhill section, a time check showed that we were approximately at the same time as the previous year. We took the downhill with moderate power and got a little recovery setting up for the right turn and commencing the climbs. We continued along but did not see any other tandems for a while. 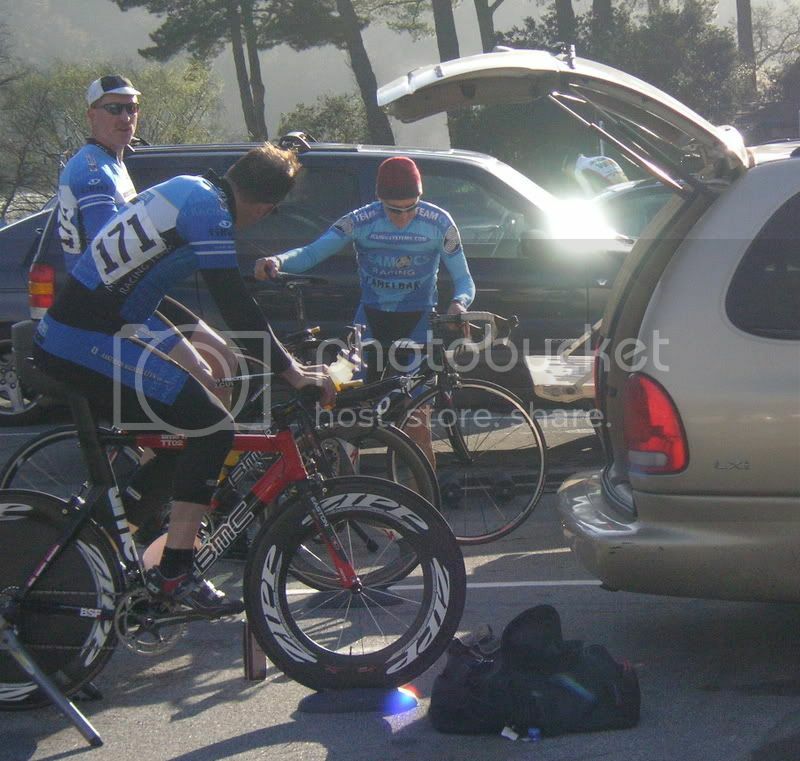 Right before Mama Bear (the first major climb, we passed the tandem team that started 1 ½ minutes ahead of us. 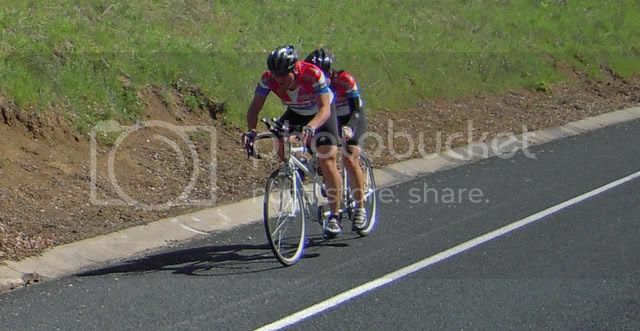 As we started our climb up Papa Bear (final climb before the finish), we passed our “two-minute rabbit” with our one-minute rabbit (male-male tandem team) in sight. We finished with a personal best. We were thrilled to capture 3rd place, and as predicted, only 59 seconds separated 3rd and 6th place. And it doesn’t get much better than winning a pound of Peet’s coffee. The course – blue is elevation,green is speed and red is stoker's HR. 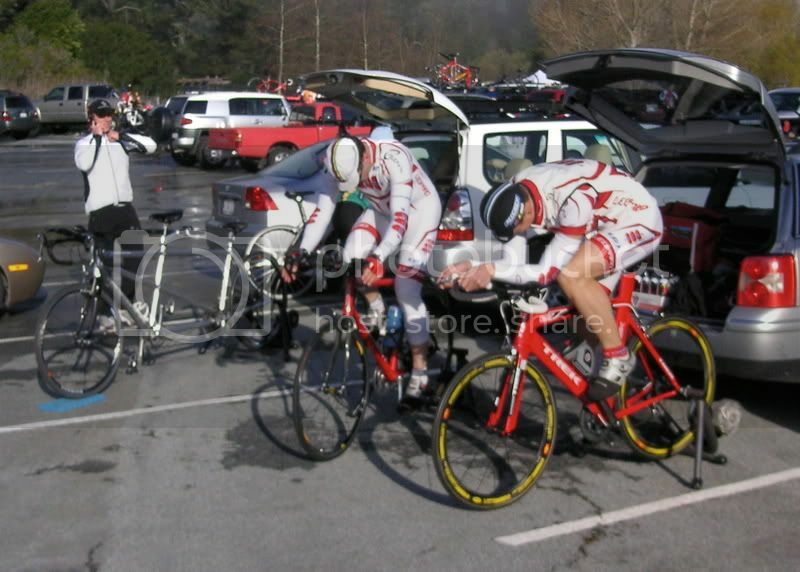 Us on one of the climbs, non-aero. Velodiva warming up. We did not see any other tandems on trainers but we did see some riding around. This venue is tough venue upon which to warm-up. It was 40 degrees and foggy when we started and there is nothing but hills. Climbing is okay but descending is cold. 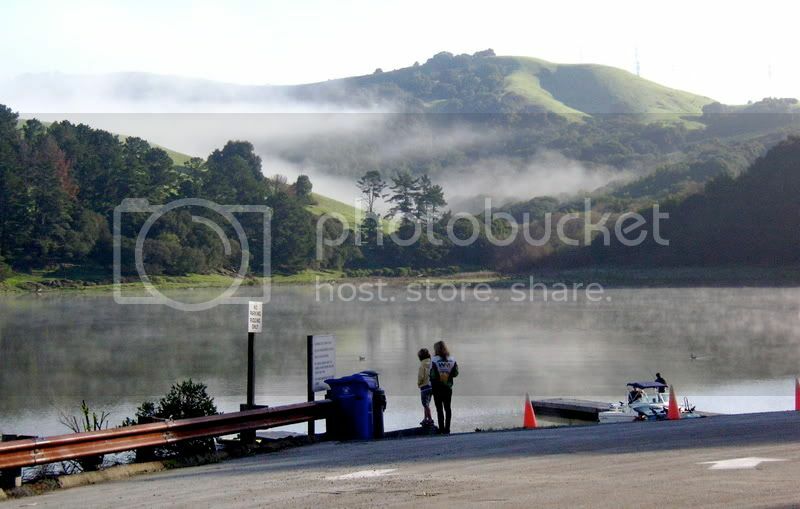 Registration and parking is at the bottom of a hill by a small reservoir. The setting is very nice. The start is at the top of a small hill. 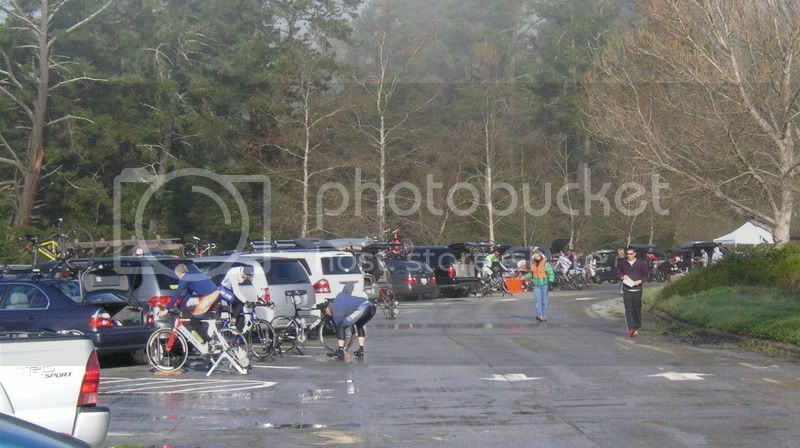 Here are some pics of the parking area and warmup – lots of interesting equipment and people warming up on trainers. Last edited by Hermes; 03-09-09 at 10:13 AM. A day I'd like to forget. We had a VERY EARLY start time of 8:02:30 which ment the sun still hadn't burnt off the fog and I couldn't see for the first 20 minutes since my glasses had dew on them. I wanted to go out hart but not pop cause I knew our 30 second guys were going to be the team to beat in the P/1/2. About 11 minutes in I hit a pot hole at thought I blew the rear tire. I yelled at my partner that I flated and were done. I rolled along and the tire seemed to still be holding air so I bounced it off the ground a couple times and it was. I then figured the disc was destroyed cause it was bouncing something fierce but still rolling. I fiddled with the brake release and opened it up(still rolling along) and yelled at him to go for it. We went on and finished with a time of 40:57 but I know we dropped at least a minute futzing with my wheel and having to be very gently with it when going up the hills. After the race I got on my road bike and rode the course backwards and was amazed at how much elevation there is in that course. It really didn't seem like that much while drilling it. 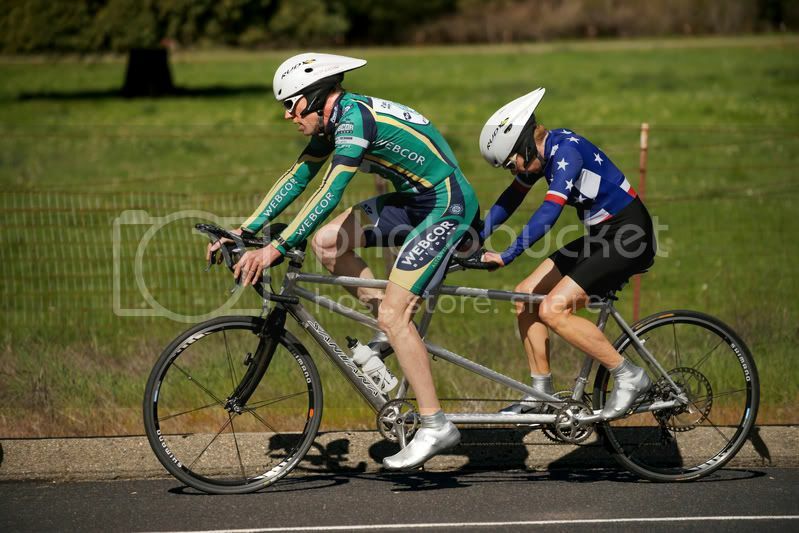 My fiancee and I raced in the tandem category. It was a great day of racing. Unfortunately we had what (for me) was a big equipment failure. My HRM was dead (battery)!! I use my HRM to keep my pace... Keep me from overexertion as well as not going hard enough. At that point I thought .... hmmmm this is a we bit early to be catching anyone and knew I that we were going too hard, so I started to back off a tiny bit. Then we hit the first roller/false flat sections and I felt my right calf twinging a bit with that "almost cramp" feeling, so I took it down a notch. At that point Rich and Mary Ellen re-passed us... After a couple minutes, I elevated the pace a bit. But that couple minutes of recovery (on the wrong part of the course to be recovering) cost us big time. We caught our 2-minute rabbit and the 2:30 rabbit was in sight at the finish. 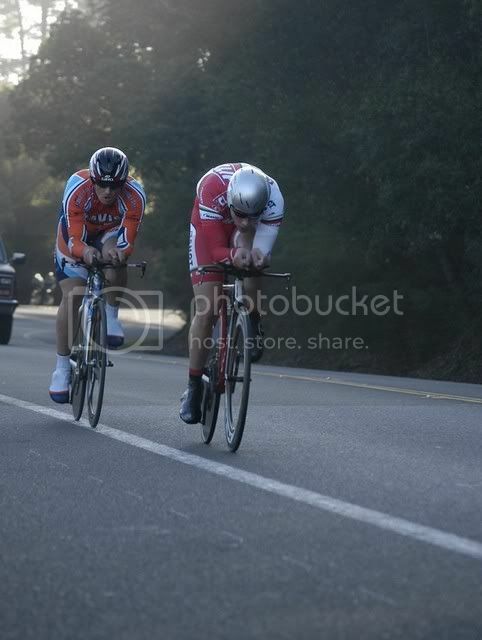 I think we did pretty good for our first tandem TT. 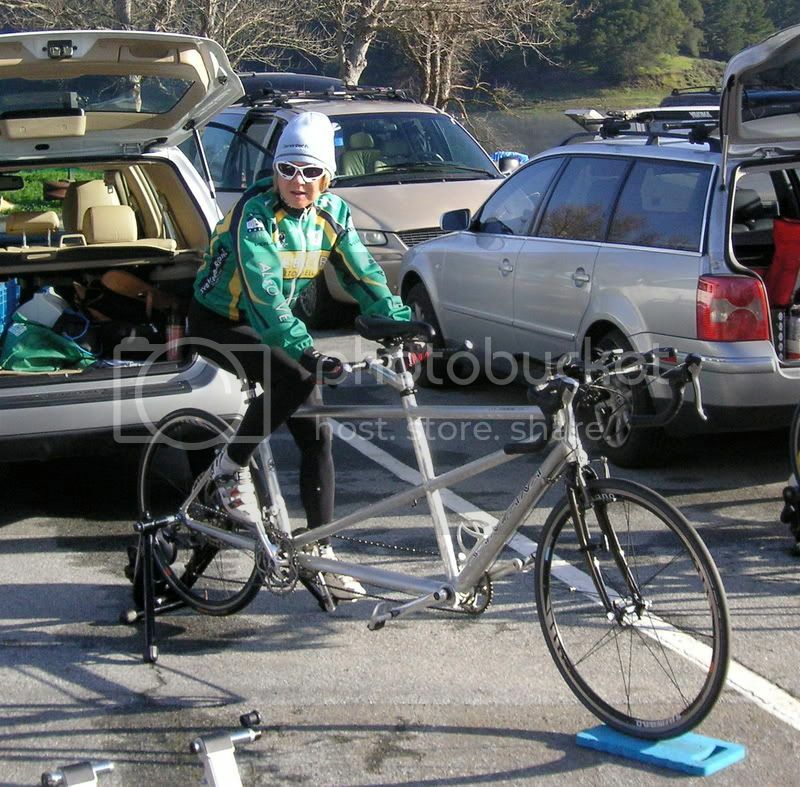 I felt pretty good in the aerobars after some tweaks I made on Friday. Next year we will do better. We went on and finished with a time of 40:57 but I know we dropped at least a minute futzing with my wheel and having to be very gently with it when going up the hills. Position and bike look great! Still a fast time all things considered. Thanks, I went back to the -25 stem instead of the -35 since I seem to be able to hold my power a little better without being much higher. 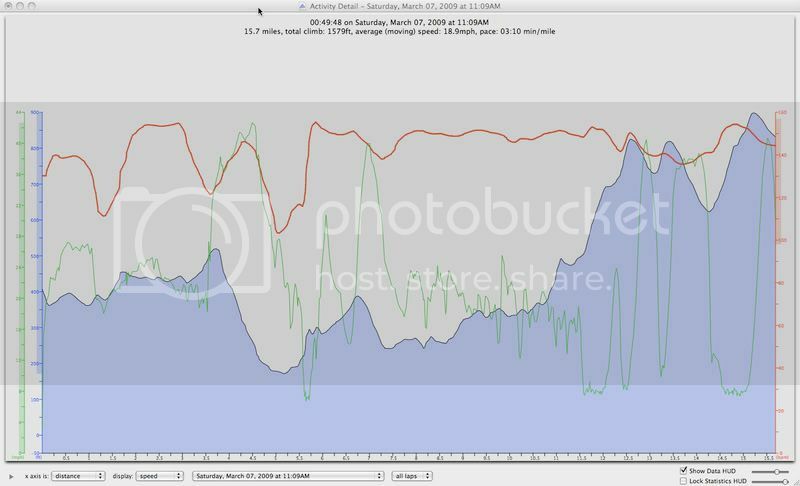 Where is the race report on setting a course record in 25mph cross winds?